The much rumored OnePlus 3T was announced recently by the company, tagging the same as an upgraded version to the earlier flagship OnePlus 3. The phone comes with 5.5 inch full HD, Optic AMOLED display with 2.5D curved glass and gorilla glass 4. OnePlus 3T runs on Android 7.0 with Oxygen OS while gets the power from Quad-core (2x2.35 GHz Kryo & 2x1.6 GHz Kryo) Snapdragon 821 processor. The phone uses 6 GB of RAM and offers 64 GB/128 GB of internal storage options. OnePlus offers 16 MP rear primary camera with EIS 2.0, PDAF (phase detection auto focus) and optical image stabilization. It even has a 16 MP front camera with Samsung 3P8SP sensor. The 3400 mAh battery with dash charge option on the phone is good for full day use while the software update scheme would stay the same for both the OnePlus 3 and 3T. The dual SIM option on the same offers better connectivity when it comes to multiple carrier usability. The phone weighs 158 grams and comes with fingerprint sensor, dual microphone, bottom facing speakers and many other practical built in features. OnePlus 3T uses new Gunmetal shade along with the Soft Gold variant while the 64 GB model can be had with a price tag of INR 29,999. The 128 GB, on the other hand is priced at INR 34,999. It will be available through Amazon.in from December 14 in India. 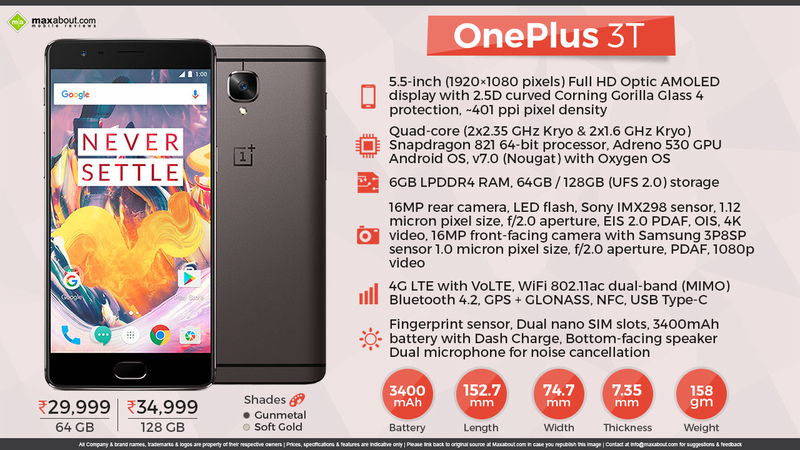 Click here to know more about OnePlus 3T.